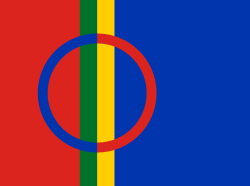 The Sami fowk (an aa Sámi or Saami, tradeetionally kent as Lapps or Laplanders) are an indigenous Finno-Ugric fowk inhabitin the Arctic aurie o Sápmi, which the day encompasses pairts o far northren Norawa, Swaden, Finland, the Kola Peninsula o Roushie, an the border aurie atween sooth an middle Swaden an Norawa. ↑ 2.0 2.1 Thomasson, Lars; Sköld, Peter. "Samer". Nationalencyklopedin (in Swadish). Cydonia Development. Retrieved June 22, 2015. ↑ Ethnologue. "Languages of Sweden". Ethnologue.com. Retrieved 2013-06-22. This page wis last eeditit on 6 Apryle 2017, at 00:45.